Rink Rover: Liveblogging hockey/cinematic history! 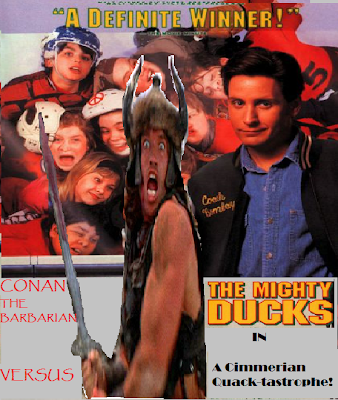 1:15 PM: Reports indicate that the Philadelphia Flyers have called up Conan the Barbarian to play for them. Right now there's no indication that this call-up involves either Arnold Schwarzenegger or Jason Momoa donning the black and orange. I will update as this story unfolds. 1:17 PM: Updates indicate that Conan will be asked to play defence, but it probably won't take long for him to go on the offence against someone who killed his parents or tricked him into animating a demonic version of a god from the Hyborian Age. 1:18 PM: I have contacted James Earl Jones' reps, but they have declined to comment on Conan's apparent revival as a hockey player. No one has indicated what number he might wear. 1:19 PM: While waiting on sources, I thought I'd address the backstory of this transaction. At the trade deadline, many thought the Flyers would trade Conan to the Tampa Bay Lightning so that his constant cries of "Crom" would help form chemistry with teammate B.J. Crombeen. The Flyers organization is now relieved that deal didn't go through. 1:20 PM: Major development here, but I can't quite confirm it. Some of my sources (and I stand by the pracitce of not naming any of my sources) indicate that Conan hasn't been called up to play with the Flyers but to start in a hockey movie as a Flyers' defenceman. 1:22: Still nothing from my unnamed source. Since he's not playing ball, I'm just going to out him. His name is Bob-Pierre McLebrunzie. 3. Youngblood 2: Crush Your Enemies, See Them Driven Before You, and Hear the Lamentations of Their Women. Here's a prototype poster for option #1. 1:22 PM: I'm now hearing that Universal Pictures is trying to get the rights to make all three of the above movies, and, as a teaser, Arnold Schwarzenegger (as Conan) will play with the Philadelphia Flyers for the remainder of this season. He will also suit up with the Flyers against the Anaheim Ducks as part of the Kraft Hockeyville celebrations in the fall of 2013. Well, there you have it. We're finally going to get a third Conan movie starring Arnold Schwarzenegger and, as an added bonus, he'll help the Flyers tank out the rest of the season by plundering their blue line. Hopefully the Wells Fargo Center doesn't hold a "bring your camel to the game" night. We don't want to see this happen again! UPDATE 3:10 PM: Apparently the Flyers have actually called up defenceman Matthew Konan from the Adirondack Phantoms. Well, perhaps some of what I wrote above can be salvaged.